While this happens to be the very same cube as the last one, from exactly the same angle IIRC, this one is of note for being output from GLSL, and more importantly this should run on AMD GPU's... but I haven't tested it. In the "Display" menu there is an option to switch between GLSL and OpenCL for rendering on the fly. I took the time to make sure they are pixel for pixel the same, correcting the GLSL fragment coords to achieve this. 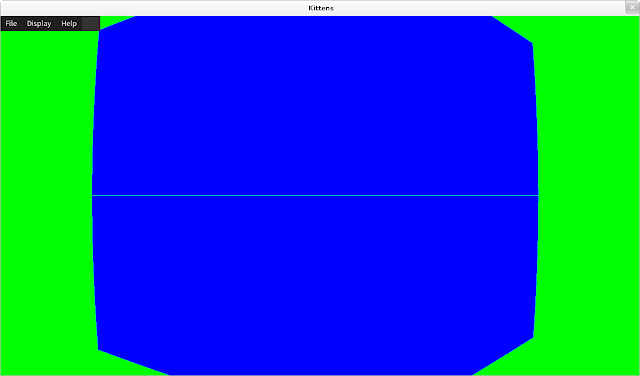 Of particular interest is the horizontal line through the middle of the cube. It only appears at certain angles, and I believe it to be the result of GLSL not handling infinity quite as nicely as OpenCL does, as the AABB-Slab method I used exploits floating points ability to store both positive and negative infinity. Alas I'm not sure if this is a bug or intended behaviour. Back in good news land, there as yet appears to be no difference in performance between the two implementations on my GTX 680. Here's the relevant commit.